For five days leading up to the world premiere of Kong: Skull Island, the Grandesign team invaded some of the most notable spots in Los Angeles and transformed them, overnight, into King Kong’s stomping grounds. Nowhere was safe. 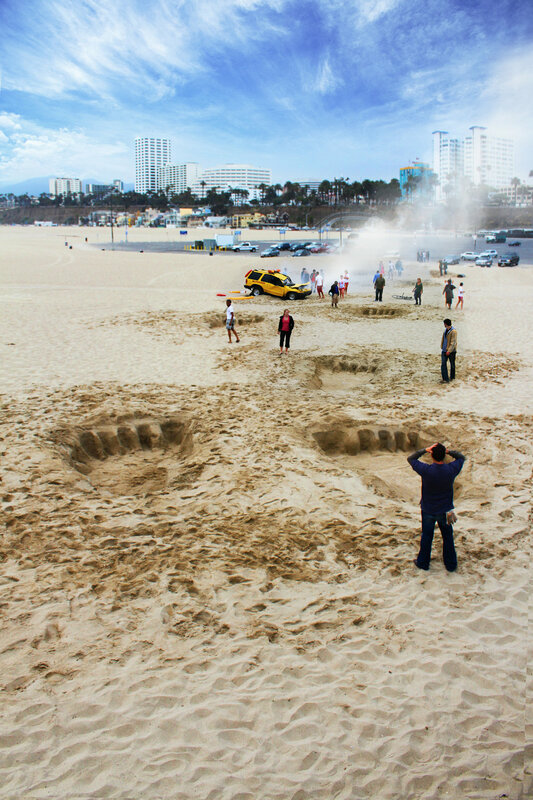 Runyon Canyon and Dockweiler Beach – a location where no “promotional activity” is allowed – were transformed with 25-foot-long footprints in the sand, and three demolished cars (which required a forklift to move.) Capitol Records, Microsoft Square at LA Live, and the Hollywood walk of fame outside the Dolby Theatre were treated with 3D CAD art vinyl and chalk. During each activation, Waze, one of the top navigation apps on Apple and Android with millions of daily users, featured custom Kong icons at the activation site. Kong’s Skull Island became a real, interactive location on Google Earth. Live, breaking TV news reports and radio reports of “seismic activity” at each location helped King Kong leave over 15 million impressions in his tracks, all over the course of a week. All this before Tim Nudd, creative editor at AdWeek, took notice and wrote a feature piece.